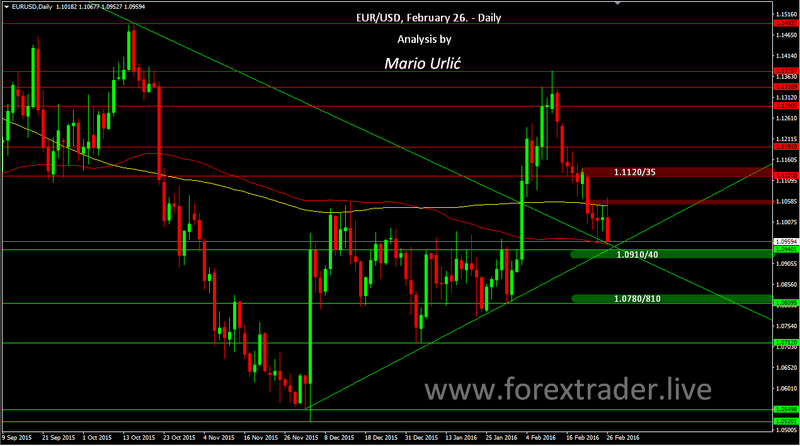 EUR/USD, US dollar stronger after GDP data! Here we are again at daily MA100 and at the important support for the euro. This time the sellers looks stronger then before two days, when they surrendered at 1.0956. Can the buyers defend this level again and turn the pair in they favor one more time? As I have already wrote in my previous EUR/USD analysis, this level at 1.0910/40 is strongly in favor of the buyers and it will be surprise to me if the sellers manage to brake this today, despite better US GDP data then we have expected. Interesting end of the week for sure. On the way back up, 1.1010/20 is the first minnor resistance, daily MA200 at 1.1050 the second one and 1.1120/30 the stronger one. Let’s see how will this day and week ended? so whats your opinion after week end , without breaking 1.0940/10 ? The problem with pullback can be daily MA100 now, which is first resistance on the way up. Support is still holding but it looks like it could be broken? Mario? It could be, yes. As I wrote for several times in this week, the euro could feel the heat from the British EU exit referendum as well and this is exactly what is happening for whole week. Sure, this is very strong technical support level and the sellers are doing everything they can to close the week bellow the support. We will see. Do objave vijesti BDP-a imao sam nelosu poziciju na paru EUR-USD,bio u longu a usao na 1.0988 na vijestima me izbaci sa 4 pipa plusa a sad imam jos bolji ulaz na 1.0955 long ,dobro se odbilo! Vidit ce mo do veceras razvoj. Fx Freak will it go back to 1.1120 ?